God told Daniel that he sealed up the meaning of his key prophecy until the end times (Dan 12:9). And even then only the righteous and wise would understand it properly (Dan 12:10). Unfortunately, this means that teachings that have been popular or taught for many decades are probably in error. A tell-tale sign that a teaching is wrong is when it allegorizes the Bible, or otherwise claims it does not mean what it plainly says. Typically the excuse given is that the passage cannot possibly be literal based on some other preconceived assumption which would be contradicted by taking the passage literally (John 10:35). Likewise, if the explanations do not incorporate the prophetic feasts of God (also known as the Jewish holidays), then they are missing another key to unsealing the prophecies. In writing this glossary I've kept to those keys just as I have in my book Know the Future. As such, it makes for a good companion to my book. I believe it is unlike any other Bible prophecy glossary you will find. Bible truth seekers can use it to audit what they have been taught to weed out errors and and come to better understanding of the Bible's amazing end time prophecies. Comments and feedback are welcome as well as any suggestions for definitions to add. This mysterious group is described in Revelation 7 and 14 using a very confusing mixture of literal and (rare) allegorical language. This causes most to incorrectly treat the 144,000 completely allegorically. While the number 144,000 is indeed the literal number of (mostly?) men, their virginity is metaphorical (as in free of man-made religion - 2 Cor. 11:2-3) following the metaphorical Lamb (Jesus Christ). The 144,000 have their special seal of mobile protection for their mission as being part of the fulfilling the mission of preaching the Gospel of the Kingdom as a witness to all nations (Mt 24:14). They pick up this baton once the Web goes down from WWIII/Wormwood and the word can only go out by foot and word of mouth. (Prior to that, I expect the Gospel to go out powerfully by Internet, bookstore and motion picture.) While commonly thought to be drawn just from only Jews (descended from the Southern House of Judah's), the 144,000 are mostly made up of their Northern counterparts: the “Lost Ten Tribes of Israel” who today are found mixed mostly among the Western nations (see BritAm.org for the astonishing proof of this). In other words, it should be no surprise that these emissaries who obey God and have the "testimony of Jesus" are drawn from the same Western peoples today where you find the testimony of Jesus predominates! This key prophecy from Daniel 9:24-27 predicts the reconstruction and destruction of Jerusalem, the two comings of the Messiah, the end time Antichrist takeover of Jerusalem, and the end of mankind's rebellion to God. The 70 weeks are divided into three periods of time: seven weeks, 62 weeks and one week. The seven weeks are from the decree of Artaxerxes in ~456 BC to rebuild Jerusalem until its completion 49 years later. The 62 weeks go from there until the Messiah's ministry began in 28/29 AD. The messiah was cut off as predicted “after the 62 weeks”(not in the 63rd week) in a implied gap period of about 2000 years before the final one week period commences. This intervening gap is also where the destruction of the temple happens. The third period or the 70th week is the final seven years that end with the Messiah's Second Coming to defeat the Antichrist. What few notice is that each of the 70 weeks so far have lined up with a Sabbath year cycle. In other words, they end on a Sabbath year. Since Jesus comes at the end of the 70th week, this means that Jesus cannot come in just any year as most Christians imagine. Instead, there is a window for the Second Coming every seven years (not to mention that the events of the first half of the 70th Week must happen first). Using this insight, we can easily rule out most set dates for the rapture/Jesus' return and other false prophecies. The 70 weeks also seem to have another fulfillment as 70 weeks of days spanning the time from when Jesus was baptized at the start of his ministry, through his death after 62nd week and his glorified appearance for 40 days until he poured out the spirit in the 70th week of his ministry. The Beginning of Birth Pains: first 3½ years with a M.E. war, world war and global cataclysm. 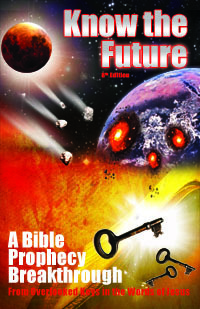 The Great Tribulation: last 3½ years when Antichrist rules the world, ending with the rapture. This odd phrase from Daniel is impossible to decipher correctly for most Christians who are unfamiliar with the Old Testament. The Law of Moses defines idolatry as an abomination to God. This matches up the Daniel's abomination with Revelation's Image of the Beast, an idolatrous statue of the Antichrist (Rev 13). Thus, the Abomination of Desolation is the erection the Image ofthe Beast (Mt 24:15; Mk 13:14) in the middle of the 70th Week (Dan 9:27). As a foreshadow of this, Antiochus Epiphanes IV erected a statue of Zeus/Jupiter (Dan 11:31; 1Macc 6:1-7). According to Daniel, this coincides with the interruption of daily oblation sacrifices at the start of the 1290 days by the Beast, exactly 30 days before the Great Tribulation begins (Dan 12:11). Jesus said that this signals the last moment to flee to the prepared place (Mt 24:15-21; Rev 12:13-17) for those not wanting to be caught unprotected or "left behind" in the Great Tribulation. The Antichrist is a popular Christian term for the Beast of Revelation. It is derived from John's epistles where antichrist is actually defined as a "spirit" of opposition to Christ or the Father found in both non-believers and ex-believers (1 John 2:18, 22; 4:3; 2 John 1:7). Over time this term has turned into a misnomer for “the Beast” of Revelation, “the Little Horn” of Daniel, and Paul's “Man of Sin”. These all refer to the coming one world government ruler of the Great Tribulation. This "man" will apparently die from a deadly wound and be resurrected through Satan's power as a setup to him claiming to be God. He then takes his rightful place to rule the world from the future Third Temple in Jerusalem (2The 2:4). He achieves this with the help of the False Prophet and Ten Kings (Rev 17) through their seven year pact to get rid of America the Babylon and rule the world. "Antichrist 7-Year Peace Treaty with Israel"
Although not supported by a single verse, this theory somehow persists and keeps end time prophecy sealed for those who hold to it. Scripture does not say the seven year treaty is a peace treaty, made with Israel, nor even broken in the middle! Nor does it say that the Antichrist is revealed at the start of this pact, but rather he only takes over after the pact has achieved the destruction of America (who the Ten Kings hate) and chaos and famine on earth from keeping Wormwood's approach secret. Refers to the short-lived battle at Jerusalem between the world's armies and the returning Jesus Messiah (Zech 14:1-15) on the Day of the LORD (Yom Kippur). Armageddon is actually only the gathering place of armies within a day or so before at the 6th bowl (Rev 16:14-16). Armageddon literally means “Hill of Megiddo” which is across the Plain of Esdraelon from Nazareth. Or Equidistant Letter Sequences (ELS) Codes. These are supposed secret messages found in the Bible through assembling letters for words using constant skip lengths. There are a few real codes in the Bible such as the word "TORAH" appearing throughout the Torah (Genesis through Deuteronomy). However, the codes claimed to be found and used predictively have proven to be just as unreliable as the common date setting theories taken from the plain text . It is obvious that the codes are too easily forced and highly subjective in their interpretation (what does it mean when the words "2010" and "death" cross?). This is the label Jesus gave for the events of the first half of the 70th Week (Mt 24:8) (before the Abomination of Desolation). The sorrows here include a Middle East Nuclear, the destruction of America the Babylon and the catastrophic passage of Wormwood. Note that the terms "Jacob's Trouble" and "the Tribulation" (in contrast to the Great Tribulation) are often misapplied to this period. Commonly thought to refer to a “time period”, this literally will be a single day in the future: Yom Kippur on the biblical date of Tishrei 10. The Seven Bowls of God's Wrath end on this day with the apocalyptic battle of Armageddon and Satan's banishment as pictured in Revelation 19-20and Leviticus 16. It is the judgment of God on the wicked nations in rebellion to him. In the Olivet Discourse Jesus identifies a (third) world war and earthquakes, pestilence and famine happening globally along with cosmic signs from heaven as the actual start of the end time events (Mt 24:7-8=Mk 13:8=Lk 21:11). This comes after centuries of religious deception, wars and rumors of wars which he said are not to be taken as signs of the end (Mt 24:6). This passage alone debunks the doctrine of imminency that says, contrary to Jesus, that there are no prerequisite events to Jesus' return. The Beast is the term Revelation uses for what Christians call "The Antichrist" (Rev 13). Another key prophecy overlooked by mainstream Christian eschatology. Malachi 3-4 predicts the coming of an end time prophet to precede the second coming of Christ, just as forerunner John the Baptist preceded the first coming. He will show people to repent from sin, religion and man's traditions and instead turn to God's word and way of life, just as John did. It seems likely that he (or possibly the Two Witnesses) will "call" God's people to a single safe place ahead of Wormwood and the Great Tribulation (Joel 2:31-2=Mal 4:5-6), much as Moses the prophet lead the Israelites in the Exodus out of slavery to where God wanted them. Head of the future one world religion who will help convince the world to worship the Beast as God (2Th 2:4; Rev 13:11-16). He will do this through the miracles, signs and wonders, the “Image of the Beast” and the “Mark of the Beast”. Scripture points to the last pope filling this role with his two horned mitre hat, claim to be the Vicar of Christ, and the clever deceptive teaching he puts out. Commonly thought to be a pretrib attack by Russia on Israel. In reality, Ezekiel 38 and 39 describe two separate wars that bookend the Millennium: first the “Battle of Armageddon” (Eze 39 = Rev 19:11-21) and after the millennium, the revolt of Satan put down with fire from heaven (Eze 38 = Rev 20:7-10). Both wars end in a single day by the power of God. When Satan is kicked out of heaven for good, it starts off a 3½ year time of trouble for the whole world beginning with the Abomination of Desolation 30 days before the Great Tribulation (Job 1:6-7; 2:1-2; Dan 12:1=Rev 12:7-12; Mt 24:15). People commonly think that the entire seven years of the 70th Week is the Great Tribulation. In reality, Jesus said the Great Tribulation would only follow the Abomination of Desolation, which Daniel said is in the middle of the 70th Week. This means it is exactly 3½ years/1260 days/42 months long as Revelation and Daniel describe in about six places (Dan 9:27; 7:25; Rev 12:14; 11:2;13:5; 11:3). The Great Tribulation is found in the Book of Revelation at the 5th trumpet and continues to the blowing of the 7th trumpet, or for three woes covering the last three trumpets. This is contrary to the popular view that the 1st seal starts the tribulation. God's saints will be on the earth throughout it in the place described in Revelation 12 not including the 144,000 who are scattered to provide the witness of the Gospel of the Kingdom against the wicked world. This is literally Judgment Day. It comes some unspecified time after the Millennium (Rev 20:11-15). Unlike the Day of the LORD judgment on the nations, this is a day of individual judgment. Those few who reject God and his law are thrown into the Lake of Fire for the Second Death from which there is no resurrection. A talking statue made in the likeness of the Antichrist. It's not going to be a hologram or some other technological trickery that any skeptic would see through. Instead, Revelation tells us that the False Prophet gives a demonic spirit in the statue so that it talks and reports those who do not worship it, resulting in their death (Rev 13:15). The erection of this statue in the Third Temple is called the Abomination of Desolation, because idolatry is the chief abomination to God. This group is described right after the 144,000 to show that the first group is not everyone who is saved (Rev 7:9-17). The time period of this multitude is unclear until you notice the palm branches in their hands. The Bible associates palms with the Feast of Tabernacles (Lev 23:40;Neh 8:15) which itself is a picture of the Millennium (Jn 12:13; Lk 9:28-33). Therefore this group seems to refer to the glorified saints ruling the earth during the Millennium (Rev 20). This is why they are in white robes and never hunger, thirst, burn nor reflect sunlight yet are around the Lamb's throne. They are not the raptured saints in heaven (Rev 7:16=Isa 49:10; see them instead in Rev 15). At the 7th Trumpet or “last trump” the Great Tribulation (wrath of Satan) ends and the Kingdom of God begins on earth (Rev 11:15-19). The first orders of business is to defeat God's enemies and replace them with God's government. This is why the rapture and resurrection of the just happen first immediately followed by the seven bowls of God's wrath. The new Kingdom of God/Heaven government consists of the newly glorified saints. (Heaven in this case is only a euphemism for God and does not denote the location.) When Jesus spoke of "inheriting the Kingdom" it was referring to being born again with a glorified body and part of God's kingdom on earth. The beauty of this kingdom is that unlike the kingdom of Israel with corruptible mortal kings that were always one generation away from apostasy, the leaders in this government will never die or be corrupted. Term for the Antichrist from Daniel 7-8. During the Great Tribulation people will be forced to take this mark on their hand or forehead as a requirement of worship of the Beast and to engage in commerce in the Beast empire (Rev 13:16-18). Those who refuse will be martyred or at least starve (Rev 20:4). Christians often worry that the mark may already be here in the form of a biochip or barcode, but the truth is that the mark will not appear on earth until after the faithful saints are taken away to the prepared place that Revelation 12 describes. Those who do take the mark are not tortured forever (Rev 14:10-11 cf. Isa 34:9-10; Rev 19:3) but they do miss the rapture and suffer through the seven bowls of God's wrath (Rev 14:10) which likely will kill them (2/3 – Zech 13:8). The 1000 year reign of the Messiah and his glorified bride as kings and priests (Rev 20:3-4). This is the Kingdom of God set up on earth finally after the 6000 years of man's self rule ending with the Great Tribulation. The subjects of this kingdom will be all the survivors of the Great Tribulation and Seven Bowls of the Wrath of God (Zech 14:16-19). Revelation 17-18 and Jeremiah 50-51 describe this economically and militarily powerful nation (“hammer of all the earth”) who keeps the Satanic beast world empire at bay. She makes shipping merchants rich and intoxicates the world with her sinful materialistic lifestyle. She will be destroyed by an enemy from the north in a single day according to the plan of the Ten Kings and Antichrist. The United States of America is the only country that fits all the literal requirements given describing Daughter Babylon and Mystery Babylon. Genesis 6 introduces the Nephilim (literally "fallen ones"), traditionally translated as giants. These nephilim are explained to be the hybrid offspring of women and the "sons of God." Scripture defines the latter as angels (Gen 6:2=Job 1:6; 2:1; 38:7), fallen angels to be specific, not the "righteous line of Seth." Although their illicit offspring were wiped out with the flood, they were recreated later (Gen 6:4). This is the source of the giant Rephaim like Og and Goliath who David fought. If you ever wondered where the demons originated that Jesus encountered in his ministry, it may be that they come out of the nephilim bodies upon death. The Bible indicates all things that offend including the demons will be collected and burned up at the end of this age (Mt 13:41) The Beast and False Prophet are included in this (Rev 19:20). This indicates that the Beast and False prophet are Nephilim, not human. The gathering of the dead and alive saints to heaven immediately following their glorification. Contrary to common belief, this event does not happen before the Great Tribulation to save the saints from it. It happens after the Great Tribulation to reward them at the same time that the dead in Christ are likewise rewarded (Mt 24:29-31; 1Th 4:16-18; 2Th 2:1-4; 1Co 15:51-54; Dan 12:1-3). The real physical salvation/escape plan of the bulk of the saints is to bring them with miracles to the place prepared for the entire Great Tribulation (Rev 12). The gloried saints then are seen in heaven on the sea of fire and glass while the seven bowls of wrath are poured out on the earth (Rev 15-16). The marriage supper of the Lamb may take place then or when they return ten days later as Revelation 19 portrays the Battle of Armageddon as a “supper”. The "first resurrection" (Rev 20:4-5) is only for the righteous and is followed immediately by the rapture of the living righteous. This happens on the Day of Trumpets right at the start of the Millennium. The next or second resurrection comes soon after the Millennium (Rev 20:5). It includes the vast majority of humanity, the unrighteous who did not qualify for the first resurrection and most Christians would be considered damned or "lost" and to be "without hope" (Eze 37:11). Unlike the first resurrection, people in this one receive a physical body like they had before (Eze 37:1-14). The apparent purpose is to let them have a chance to live in the flesh with all the knowledge and information about God and his way of life they need to make a "decision for Christ." Due to ignorance or the deception of Satan and his demons, they lacked the information or help they needed in their first life. Satan and the demons will no longer be around to deceive them this time. At the end of this life, they can finally be held accountable for knowing the truth and acting on it. The third and last resurrection is necessary for those in the second resurrection after they die so they can stand in the Great White Throne Judgment before God (Rev 20:12-13). Based on their choice they either go to the lake of fire and cease to exist or join those from the first resurrection in the kingdom with glorified bodies and eternal life. The "first resurrection" (Rev 20:4-5) is only for the righteous and is followed immediately by the rapture of the living righteous. This happens on the Day of Trumpets right at the start of the Millennium in which the righteous reign. (Hebrew: Shmittah) The Torah that God gave ancient Israel through Moses required that they leave their land fallow every seventh year. Like the rest of God's calendar he gave to Israel, there is a prophetic fulfillment to this command. This year, with its land rest and the release of debts and slaves, pictures the return of the Messiah and the establishment of his kingdom. The first Sabbath year Israel kept established the Sabbath year cycle. Every following seventh year is also a Sabbath year, whether Israel is around keeping them anymore or not. Daniel's 70 weeks were established on this grid as you can prove out from Nehemiah's time and the Messiah's ministry beginning at the 69th Week of Daniel. Finding the Sabbath year cycle therefore helps you establish which one out of seven years in present time the Messiah can return because when he comes it will again be a Sabbath year, the Sabbath year at the end of the 70th Week of Daniel. As an aside, "Lucifer" is not the name of Satan (Isa 14:12). It is a Latin transliteration of the Hebrew word Helel/Hillel, referring to the chief deity of the Canaanite pantheon. The return of Jesus at the end of the 70th week of Daniel as king of the earth. Last time, Jesus came at the end of the 69th Week of Daniel to serve and teach. His next coming will be on the holy day of Yom Kippur or the Day of the LORD. Contrary to common belief, this event is not imminent nor can come at any moment but must wait for certain prerequisites overlooked by Christians (Mt 24:6). Bible prophecy lists many end time events that have not happened yet. Also, Jesus makes two other appearances on two other prophetic feast day fulfillments; Pentecost for the sealing of the 144,000 (Rev 14:1) and Trumpets for the rapture of his bride (Rev 11:15; Mt 24:29-31). Right before God's Kingdom on earth begins at the 7th trumpet, an angel will utter the seven thunders (Rev 10:3-4). Remarkably, John was forbidden to write down what they said. However, we can extrapolate much of the content given the timing of this event just before the 7th trumpet rapture (Rev 10:3-4, Rev 11:15) and seven bowls of wrath following on its heels. Psalm 29 and other verses in Revelation associated with thunders also suggest that the thunders are the actual voice of God (which often is delivered through angels in Scripture). Given this, it seems reasonable that God must be announcing his immediate takeover of the world, explaining the coming disappearance of his saints in the rapture, and also warning the world about the grievous punishment about to begin including of course the reasons for all the above. If these things were written down, many mysteries including the timing of the rapture would be plain and clear. According to Jesus, God's plan is not to make his truth easy and obvious for all (Mk 4:11), but to obscure it to require freewill choice to both discover it and want to obey it. Revelation 17 describes ten powerful rulers. They are not kings because they have no kingdom yet. Still, they have the power needed to bring the Antichrist into world rulership which they do so they can rule openly with him. It appears that they accomplish this by keeping the coming Wormwood disasters secret and accentuate the resulting crisis. They also specifically cause the destruction of Mystery Babylon who is pictured as keeping the Beast at bay or out of power (riding him). These ten kings may be the Bible's confirmation of the infamous Illuminati, rumored to pull the strings of all the world rulers. Commonly thought to be the first half of the 70th Week or other long periods related to the Great Tribulation. This is actually the same single day event as Armageddon: The Day of the LORD (Jer 30:6-7=Isa 13:6-9). See Great Tribulation. Note: the "Tribulation" and Great Tribulation are not the Bible's terms for the first and last halves of the 70th Week. There is only the Great Tribulation, or The Tribulation. The first part of the 70th Week is called the "beginning of birth pains/sorrows" by Jesus. During the 1260 days of the Great Tribulation, these two prophets witness against the Antichrist at his headquarters, the Third Temple in Jerusalem (Rev 11:1-4; Dan 11:45; 2Th 2:4). When their witness is finished, they will die 3½ days before the resurrection of the dead in Christ (and rapture) on Tishrei 1 of the biblical calendar, of which they are the first two raised. These two seem to be the two witnesses required to give the testimony of the crescent new moon of Tishrei per the ancient tradition kept in Jesus' day. Although certain people always think that the Two Witnesses will be Elijah and Enoch or Moses and Elijah, the truth is, like John the Baptist, they will be two new men who come in the spirit and pattern of Moses and Elijah (Rev 11:3-13; Mal 4:5-6). Probably just like them, one will be from the southern House of Judah, and the other from the northern House of Israel. The Woman is one of the rare topics in Revelation (like the 144,000) that mixes allegory with the normal literal narrative. The result is the misunderstanding that the Woman only represents Jews who are left behind after the Church receives preferential treatment via a supposed “pretrib rapture”. However one thing is clear that, like the 144,000, the Woman is made of the faithful of all Israel. This is conveyed through the literal constellation (“sign”) of Virgo, the Virgin Woman (Hebrew: Betula) in the heavens. We know it represents all twelve tribes of Israel (not just two tribes called the Jews) thanks to Joseph's dream (Genesis 37:9-10). These are the faithful or righteous of Israel from which the Messiah came (Mary was righteous). The Devil (the dragon) attempted to kill the man child at birth through Herod's Massacre of the Innocents. He failed and so we see the male child ascend to heaven until the day he will return and rule with a rod of iron (Rev 19-20=Ps 2:8-9). That all is the setup for using Woman of the literal constellation allegorically as the symbol of the righteous of Israel on earth in the end times. We are shown through the Woman how God will protect all the righteous from all nations during the Great Tribulation (3½ years or time, times and half a time). Revelation 8 predicts this literal doomsday star will poison one third of the world's fresh water before the Great Tribulation (Rev 8:10-11). With careful analysis, it also can be shown to be responsible for all the cosmic disturbances and calamities listed from the 6th seal to the 4th trumpet which happen in rapid succession. It would also have to be responsible for a literal change from our current 365¼ day year back to a 360 day year as Revelation indicates by its 1260 day/42 month/3½; year length assigned to the Great Tribulation. Wormwood will put the earth in such chaos and famine that the Antichrist will be able to ride the crisis into power (especially with America the Babylon out of the way just before Wormwood). Unfortunately, this key prophecy about Wormwood is completely missed by popular Christian eschatology, probably due to the confusing language. The prevailing notion that Wormwood is only an allegorical star that predicted the 1986 Chernobyl nuclear disaster also muddies the waters. Unfamiliarity with these supposed “Jewish Holidays” is one of the chief reasons that Christians do not understand Bible prophecy. Paul said they were shadows of good things to come and Jesus stated that the Torah (that contains them) must be “fulfilled”. In other words they are prophetic templates. Without these prophetic templates overlaid with Revelation, Daniel, the Olivet Discourse and others, prophecy is sealed. These set apart days all occur in the months of Aviv (1st), Sivan (3rd) and Tishrei(7th). There is one pilgrimage feast in each of those months required for all males in Ancient Israel to travel to Jerusalem to celebrate them. (Hebrew:Pesach) Aviv 14. This term actually refers to a lamb, not a day. It is the lamb sacrificed on the 14th of Aviv. The lamb is eaten on the evening of the 15th, the first day of Unleavened Bread. Prophetically, the lamb pictures the Messiah paying the price for grace to cover all human sin. (Hebrew: Chag Ha Matzot) Aviv 15 through Aviv 21. This pilgrimage feast is observed by removing all leaven from Israelite homes and eating matzahs (flat bread). Prophetically this pictures the removal of malice and deceit from the believer's heart over his lifetime (seven days pictures completion). It is fitting that this feast follows Passover given that the reconciliation to God that Jesus' sacrifice makes possible is the first step. (Hebrew: Reishit Katzir) This festival marks the start of the count to Pentecost. It is the Sunday after the Sabbath that falls during Unleavened Bread. On this day the priests were to take the first omer of wheat to mature from Israel's fields and wave it before God on Sunday morning. Before they had done this no one could harvest their fields. Prophetically this pictures the ascension of Jesus after his resurrection earlier that same first day of the week (sometime after Sabbath sunset and before Sunday sunrise). (Hebrew: Shavuot) Always on the Sunday in Sivan that comes seven weeks after the Sabbath that falls during Unleavened Bread. This pilgrimage feast day is positioned between the spring and fall feasts and was partially fulfilled in the first century. It still awaits its final fulfillment some 2000 years later before the end times events represented by the fall feasts can happen. Peter's Pentecost Day interpretation of Joel 2:30-32 tells us this will happen at the same time as the 6th Seal and pouring out of the spirit again on the 144,000. (Hebrew: Yom Teruah) Tishrei 1 or the 1st day of the 7th month on the biblical calendar. Prophetically, this fall feast pictures the rapture (and resurrection) of the saints which will happen on this day. It is the day of shouting or announcements. The Messiah was born on this day (not Tabernacles) and the seven thunders will be announced on this day as well. (Hebrew: Yom Kippur) Tishrei 10 on the biblical calendar. This is the only fast day commanded by God. The fast is appropriate due to the solemn nature of the day prophetically. It pictures the apocalyptic events of Revelation 19 when Jesus returns to defeat the world's armies under the influence of the Antichrist and Satan. (Hebrew: Sukkot) This fall feast runs from Tishrei 15 to Tishrei 21. Native-born Israelites are commanded to live in booths (sukkah) during the week. Prophetically it pictures the Millennium and is associated with palm branches (Rev 7:9-17). (Hebrew: Shemini Atzeret) This pilgrimage feast day immediately follows the seven days of tabernacles yet is a separate holiday on Tishrei 22. Prophetically it pictures the Great White Throne Judgment of Revelation 20 which similarly comes after the Millennium that the seven days of Tabernacles picture. I too have been searching for your belief, not so much the Trinity, but as to the nature of Christ. Before I spend a lot of time reading work by someone, I need to know what their basic beliefs are. Do you believe Jesus (Yeshua, I have started reading your posts!) is God? And that He died to pay for our sins? Shirley, I apologize if this answer is offensive to you, but if you need to know about my personal beliefs on topics I do not write about (such as the “Nature of Jesus”) before studying what I do write about and evaluating that on its own merit against Scripture (Acts 17:11), then it’s possible that my writing is not a fit for you. After all, Jesus made it clear this walk is about what you do: loving God and neighbor and not your theology. If that’s what I also teach and focus on, why fuss about whatever theology may be in my head that I don’t teach or act on? Tim, I really like this glossary. All your articles are well written and the glossary compliments them helping to make the basic terms and concepts clear. One very important topic that you guys should include is “What is the House of Judah and the House of Israel”. Costas on Three Big Events I Expect In 2022 Based On Two DreamsYou are not the antichrist - you're just a very naughty boy. Ed sterblitch on The Day Atheism Ends, Worst Day Ever—But For You?Tim, where he fulfilled the prophecy of Obadiah 1: 3,4, Space nest among the stars?